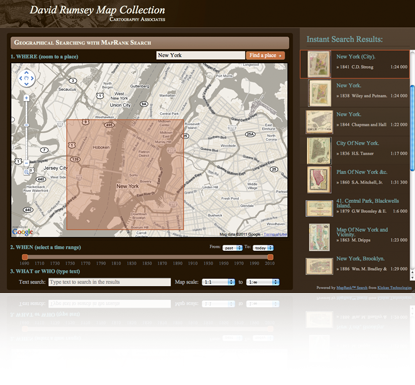 Unique technology to explore thousands of maps in time. Choose a place, select the time range, search and get the most relevant results. 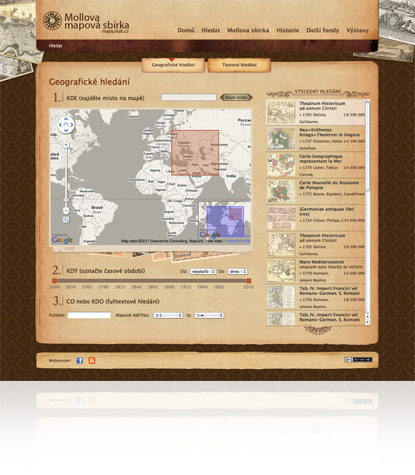 Welcome to the MapRank Search, a unique technology to explore collections of maps in time and space faster then ever before. The web interface together with a new indexing mechanism significantly improves the way people use and explore collections of maps or geographic data. With MapRank Search anybody can naturally discover the documents he/she is looking for. Users will be pleasantly surprised how enjoyable the search process can be: the standard panning and zooming of the base map, familiar from the Google Maps interface, automatically refines the query. New documents from the catalog are dynamically presented in the list of results along with their geographical footprint - sorted by the MapRank® algorithm - with the most relevant documents geographically at the top. The chosen geographical area of interest on the base map is only part of the query. 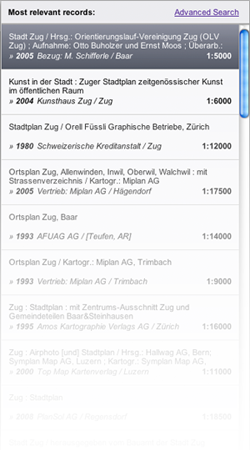 Users can also select the time range on a timeline to define their selection more precisely. Such spatio-temporal requests are evaluated by the search engine and it immediately retrieves the most relevant maps or other documents. Users can also use traditional text search to refine the query further. This means they can easily get answers for questions such as: "maps from the 18th century printed by a particular publisher depicting a given area". Such queries are extremely hard to make with traditional, full-text search systems. Full-text alone would only identify relevant documents if users provide text which is referenced in the document's catalog entry. In addition to the above search criteria (area of interest, time range, text search) users can further narrow a search using predefined search categories such as "held by particular library", "not geological" etc. Such conditions can, of course, be combined to filter the results exactly in the way users require. The MapRank algorithm ensures that the geographically most relevant documents are always on the top of the result list - and it also combines geographical query with the text search, selected time range and the map scale. The indexing process supports existing metadata standards used today in large catalogs, including formats such as MARC (with field 034), DublinCore (with DCMI Box), FGDC or ISO 19139. Every indexed document must have a numerical spatial extent (boundaries in known coordinates, typically WGS84). Existing metadata records without a numerical footprint of their coverage can also be enriched with the help of tools we provide. It is also possible to implement the search on top of large collections of GIS data - for example rasters (GeoTIFF, MrSID, ECW, GeoPDF, etc), vectors (ESRI ShapeFile, OGC/Google KML, etc) or online services (OGC WFS, OGC WMS, etc). An almost live update of the search system can be implemented by automatic synchronization with the source catalog typically via OAI-PMH. MapRank Search can easily exchange metadata with most existing commercial or open-source library systems or geo-spatial catalogs. MapRank Search comes with an interactive Web 2.0 interface, which is very fast and responsive and runs practically in every modern web browser. Users do not need to install any software, they can just open the search system in a web browser. The web interface is prepared for customization: you can easily embed it into your website, present it with your own design, with your logo in the header, or provide the MapRank Search functionality completely as part of your existing websites. Localization is possible as well - the interface can be presented in multiple languages. 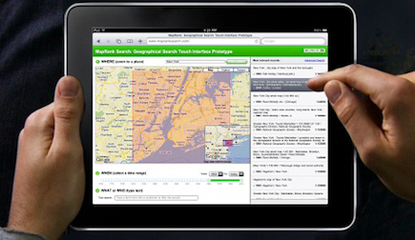 By default the search interface utilizes the popular and fast Google Maps as the world-wide base map. There is also possibility to use Microsoft Bing Maps, OpenStreetMap data, Yahoo Maps or any country specific mapping datasets such as Ordnance Survey OpenData (United Kingdom) or even a publicly available OGC WMS service provided by a local geospatial authority. MapRank Search can index millions of records without any problems, and directly search them in a fraction of second. Results are then immediately presented to the user in a modern and intuitive user interface. MapRank Search brings into life the concept of "spatial browsing", because it allows intuitive exploring of the catalog and automatic retrieval of the most geographically relevant documents. With the help of the freely available Google Earth plugin the system can be used for browsing through your catalog even in a three-dimensional environment - all inside a web browser. © Copyright 2014 Klokan Technologies GmbH. All Rights Reserved.